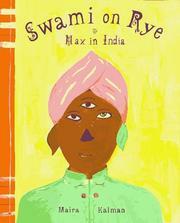 Children's Picture Book Database at Miami University | Swami on rye: Max in india? Swami on rye: Max in india? When Max, a famous dog poet and Hollywood director, leaves the house to get a snack for his pregnant wife, he ends up magically transported to India. In this exotic adventure of unfamiliar sights, he searches for the meaning of life, but returns home in time for the birth of his family. Kalman, Maira, “Swami on rye: Max in india?,” Children's Picture Book Database at Miami University, accessed April 20, 2019, https://dlp.lib.miamioh.edu/picturebook/items/show/7136.